To dazzling displays of bonbons bursting from a bevy of blossoms. An elaborately draped blackamoor displays a stunning bouquet sent by a suitor with the card “see you tonight.” His boutonniere matches the bouquet, providing a subtle reminder throughout the evening of his adoration. Our formally attired couple depart for dinner and dancing at this swanky night club. 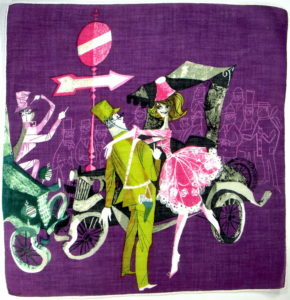 Note the woman in the foreground carries a purple handkerchief in her palm. 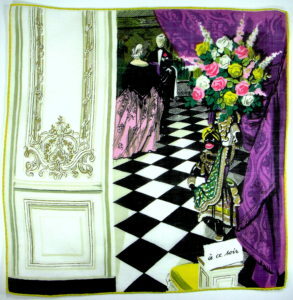 The silk scarf and top hat on the chair confirm this hankie hearkens back to a time when people dressed to the nines for an evening on the town. Even the pianist is in formal attire. 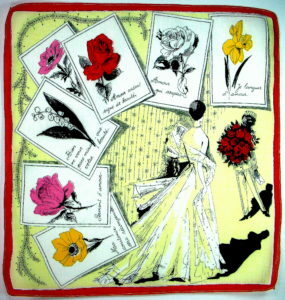 Each flower speaks its own love language, and the gentleman who gifted this handkerchief cleverly covered all the bases. When dreaming of flowers, moonlight and love songs one often thinks of Paris, of strolling along the Seine with your inamorata, stealing a kiss in the shadows. Whether dining al fresco to the sound of violins, or falling fast for a handsome gendarme, the City of Light provides the perfect backdrop. When a lover’s ardor is equal to the greats in history, he bestows this on his beloved. Indeed, kings have pledged kingdoms and abdicated thrones in the name of love. What girl wouldn’t want to carry this all-encompassing tribute to love in her pocket? 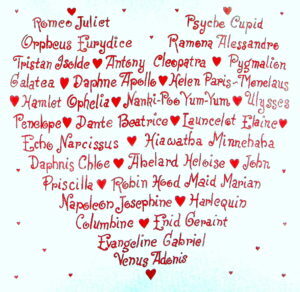 Adam and Eve, Samson and Delilah, Romeo and Juliet, Napoleon and Josephine and Antony and Cleopatra. Now there’s a proclamation of passion! The following courting couples run the gamut from East to West. The thoughtful, serene, detail-rich images encourage you to immerse yourself in affairs of the heart. 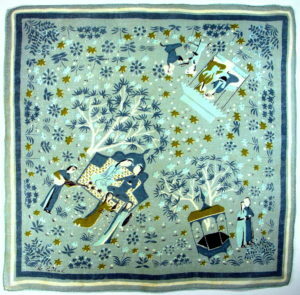 Although not in perfect condition, this antique handkerchief is so lovely it must be shared. 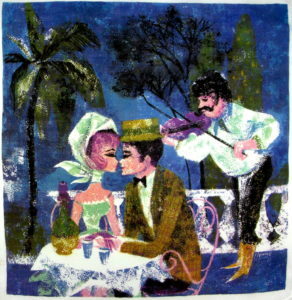 The message reads: “I want your kisses” and “Tell me if you love me”. 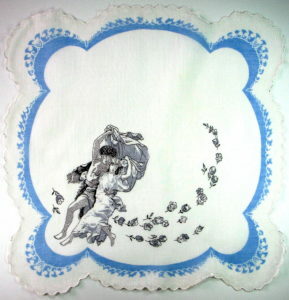 This charming scalloped hankie appears to depict Eros running away with Psyche. You may recall in Greek mythology, Eros’ mother is Aphrodite, the Goddess of Love. Aphrodite learns that mortal men, instead of worshiping her, have begun to worship the breathtakingly beautiful (but mortal) princess Psyche. Seething with jealousy, Aphrodite commands her son Eros to make Psyche fall in love with the ugliest creature on earth. Yikes! Instead, Eros himself becomes hopelessly infatuated with Psyche and spirits her away to his home. Oops. Mama’s plan backfired big time. From the look on their faces, it appears mom may be in hot pursuit. When it comes to gods and mythology, artists Tammis Keefe’s centaurs have a grand time spiriting away beautiful women, prancing and parading, and offering wine and song. On the right, Keefe pairs men with men, ready for a game of tennis or flying kites in the park. 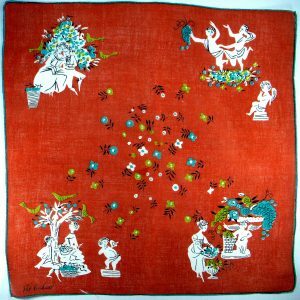 Considering this hankie is from the 1950’s (Keefe passed away in 1960) Keefe was way ahead of her time in terms of equality for all. 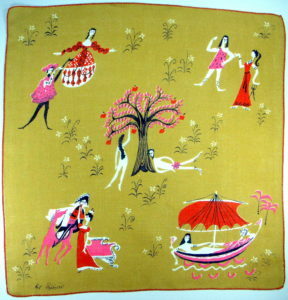 One category which has cornered the market when it comes to romantic images is the lipstick handkerchief, used by a lady to blot her lips after applying fresh lipstick. 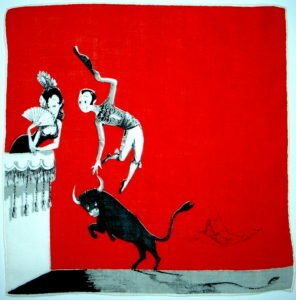 These darling hankies show to what heights man will climb for a kiss, whether from a Venetian gondola or Spanish bull ring. “Then I did the simplest thing in the world. I leaned down…and kissed him. 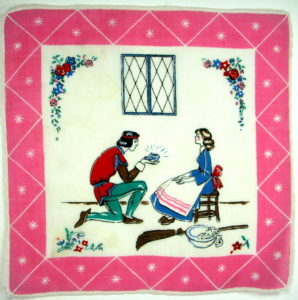 Rescuing fair damsel is always a popular theme, whether scaling a tower, or stopping a runaway steed. 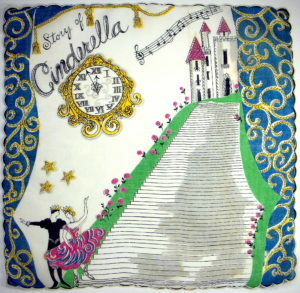 Many girls still long for the Cinderella fairytale. The most poplar version, (though not the first) was published by Charles Perrault in 1697. Yes, centuries ago – but the fantasy still abides. It was even reenacted as a ballet, performed in 1945 at the Bolshoi Theatre. Note the ballet slippers on our heroine. Many girls have met what they thought was Prince Charming only to never have him call, much less search an entire kingdom for her, toting a glass slipper. Could Manolo Blahnik have had such persistence? Christian Louboutin such constancy? Salvatore Ferragamo such fervor? 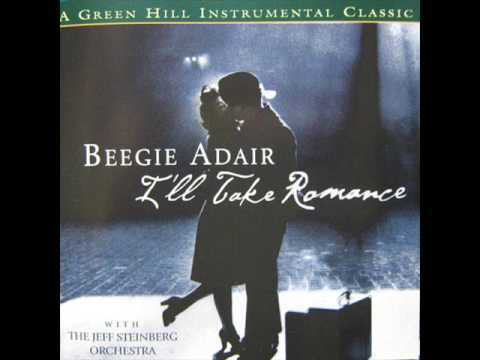 If you haven’t experienced a broken heart (you must be younger than 12) your turn will come – to collapse sobbing against a lamp post when your intended walks by with his arm around his new love. Or perhaps you’ve found yourself waiting at the kiosk (the restaurant, the movie) only to discover you’ve been stood up. 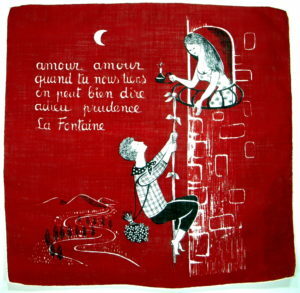 These hankies were created for the abandoned lover, and encourage us to go ahead and cry. 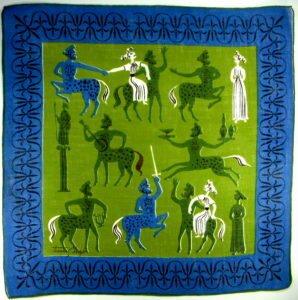 The range of handkerchief subjects never ceases to amaze. 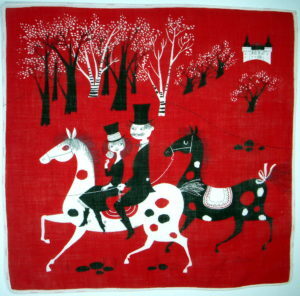 A hankie truly is a storybook in your pocket. 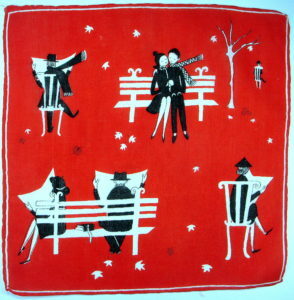 Or perhaps a serendipitous meeting in the park, where everyone is mating – the birds, the squirrels. She’s read the same sentence in the novel she’s holding at least five times, while he doesn’t even pretend to read his newspaper. Cute! 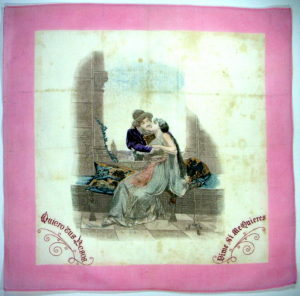 Courting was once an art, and a man courageously offered his heart, hoping the lady would accept, as these delightful Ritva Coffron hankies attest. 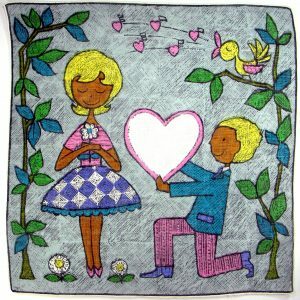 Dating was expectant and hopeful. But then we got hip and cool in the Mad Men era. 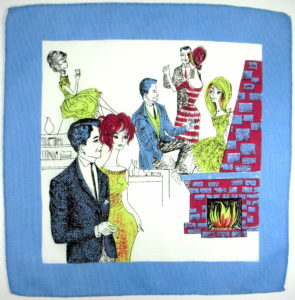 Guys had swinging bachelor pads where they took their chicks to party with other groovy dudes, as this hankie aptly attests. We ordered our martinis “shaken, not stirred” à la James Bond. 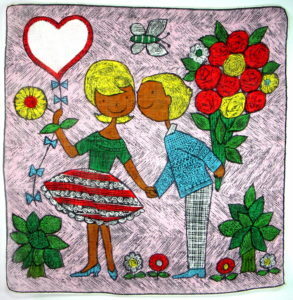 Soon the sexual revolution was upon us, and the handkerchiefs were as funky and far out as the hippies who sported them. Today? Alas, courting consists of thumb punching and swiping left or right (see Words of Love). The height of laziness. 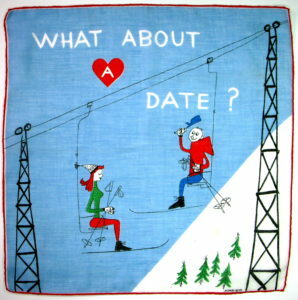 If that’s your idea of dating, you deserve what you get. 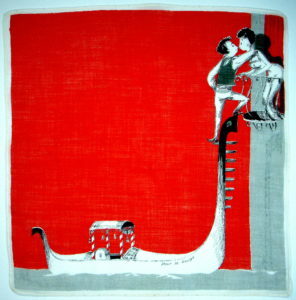 In our final hankie, we root for the lovers who cuddle and coo, while everyone else remains isolated and entrenched in their papers. (Perhaps they’re perusing the personals?) 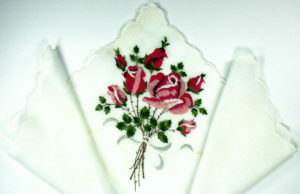 Swap out the newspapers for cell phones and this hankie would personify today. 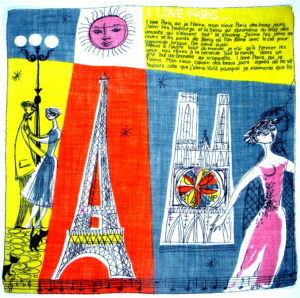 Here’s wishing you Big Love and all its accoutrements – flowers, candy, weekend getaways, champagne, lingerie, lovely handkerchiefs – and not just photos of them attached to a text! 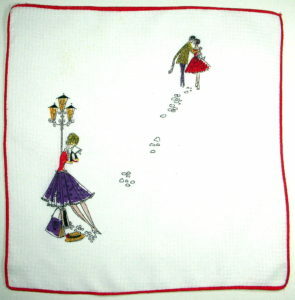 Carry a lovely handkerchief and indulge your romantic side and someone will notice, I assure you. And it only takes one to turn your world around. Although the old saw claims a sailor has a girl in every port, this happy go lucky mariner appears smitten, committed, devoted to just one girl. But wait. Take a look at the border – notice anything strange? The baseline (the line on which all the words sit) faces the inside border, while the tops of the letters face the outside border. 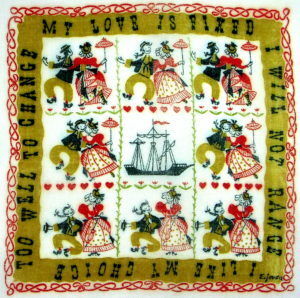 All the lines except for one that is: “I like my choice.” Not only does the line read upside down in relation to the rest of the hankie – it reads backwards!!! We can allow the artist one mistake, but upside down and backwards? Methinks the artist was sending a hidden message – either about the sailor’s relationship, or perhaps his own! What say you? What’s your take on this mistake? Was it a design debacle or subconscious declaration? 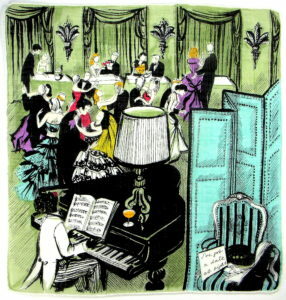 I wish I could see all your blogs in one glorious art book filled with color plates of all the handkerchiefs on one side and the story on the other. Your writing is fabulous and makes every era so easily accesible. Your subject is delicious and the historical details not something with which many people are familiar. 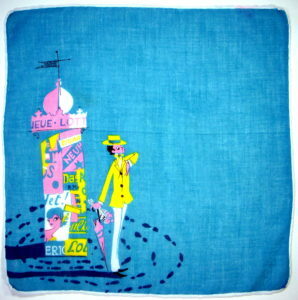 I send your blog to the most elegant, handkerchief-carrying (yes a fresh one every day!) women I know, and they are stunned with delight at the history and high art of it all. By the way, so am I at every new picture and photo. 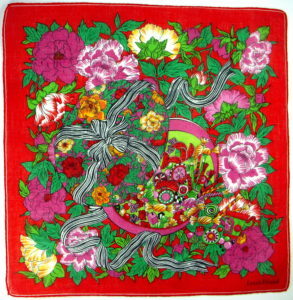 I was raised as one of those fresh handkerchief a day girls, and to this day, I still, before leaving the house, check my purse to see if I have a fresh hankie. Oh, and yes, I iron them. All gorgeous ones, either lace or pictorial or embroidered with my initial as if I were the most important lady of the day. Now I have all my mother’s handkerchiefs and carry a bit of her with me each day, and looking at that ever-present beautiful pale blue “R” makes me smile. You are too kind. It’s always nice to hear when people appreciate your work. 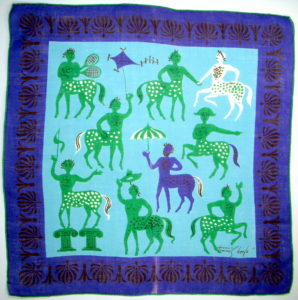 Nice to meet a fellow hankie lover. 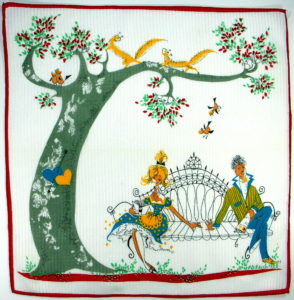 You’d be surprised to know how many readers have told me that a certain handkerchief, fountain pen, alligator watch band, cufflinks, or cashmere scarf make them feel “truly dressed” and/or “a little bit special.” In today’s out sourced/on line world, where so much of our work and interactions are electronic, wearing something bespoke or vintage can return you to a tactile world, an appreciation for style and craftsmanship.Thank you for writing in. 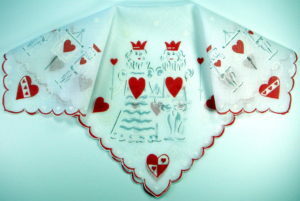 A wave of the hankie to you.